This entry was posted in Wycombe News on April 24, 2019 by Mike King. This entry was posted in Wycombe News on February 22, 2019 by Mike King. This entry was posted in Wycombe News on March 19, 2018 by Mike King. 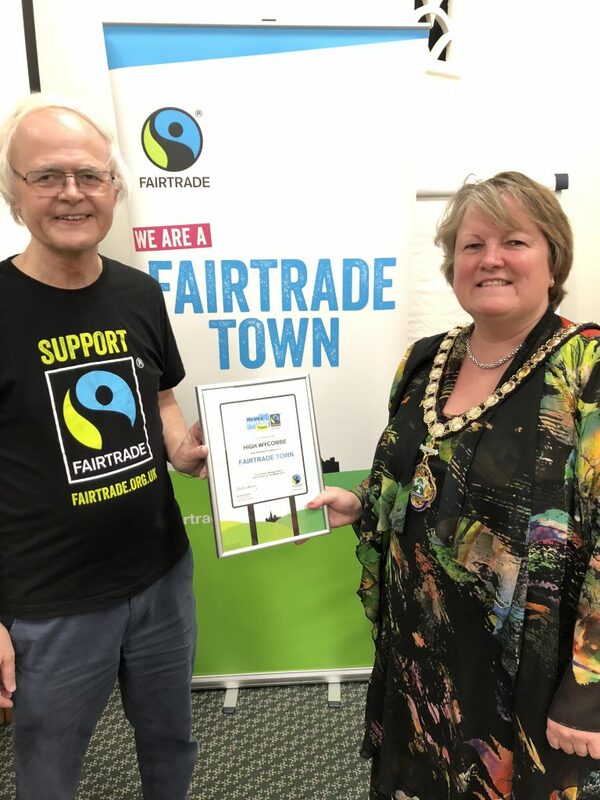 An evening event was held on Thursday 22nd February 2018, for the Chairman of the Wycombe for Fairtrade Steering Group, Mike King, to present the Wycombe Fairtrade Town Renewal Certificate to the Chairman of Wycombe District Council, Cllr Suzanne Brown. Around 30 councillors attended the event following a long meeting that did not finish until 8.45pm. I think they found the food and drink refreshed their spirits. There was a very positive atmosphere and the wooden-panelled committee room was an ideal location. It was interesting talking to some of the councillors and listening to their ideas regarding moving Fairtrade forward. 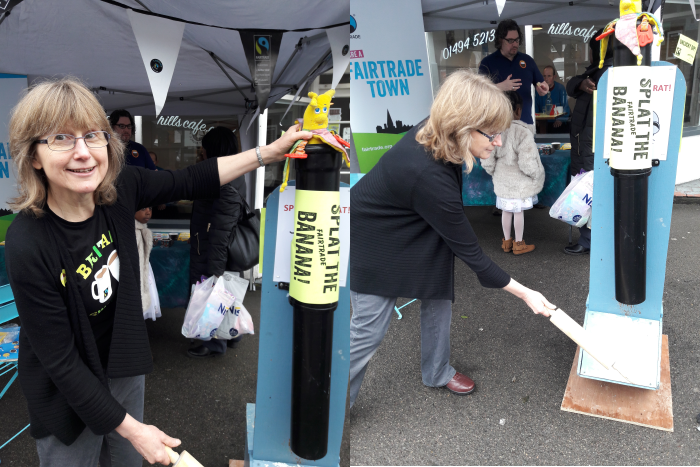 A couple of the councillors had been exploring the possibility of improving signage to reflect that High Wycombe is a Fairtrade Town in dialogue with Bucks County Council. The Steering Group had no idea this avenue was being pursued. Also, councillors took away many copies of the latest “Directory of Wycombe Town Fairtrade Outlets 2018 -2019”. 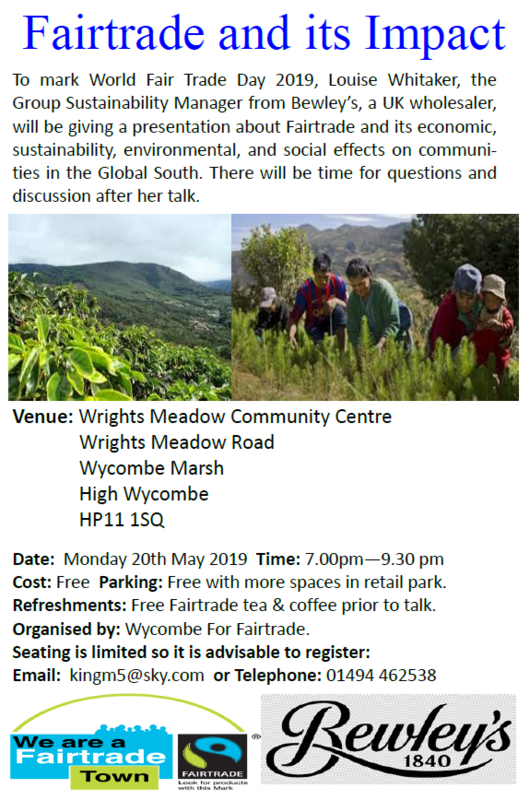 The overall impression was that it cemented the Wycombe For Fairtrade Group’s links with the Council, and that our plans for future networking with international groups and producer cooperatives received many nods of approval and favourable comments. This evening turned out to be exactly the informal, enjoyable, celebration event that the Steering Group hoped it would be. This entry was posted in Wycombe News on March 12, 2018 by Mike King. 3 Harman Terrace, Copyground Lane, High Wycombe, Bucks. 10.30 am to 11.30am. This meeting was arranged to update respective parties with regard to developments over the last year. PEROS are the Flagship Employer for High Wycombe and a wholesale distributor of Fairtrade food, snacks and drinks, especially tea and coffee under the EROS brand. Are PEROS preferred to continue in their role as the W4FT Town’s Flagship Employer? Would Peros send a representative to the W4FT Steering Group Fairtrade Foundation Town Renewal Certificate presentation to the Chairman of WDC on Monday 29th February 2016 at BNU? Would Peros be prepared to donate boxes of Fairtrade Double Chocolate Muffins for the Foundation Town Renewal Certificate presentation, the Farrtrade Swap Shop prior to Fairtrade Fortnight, and for charitable events like the Fairtrade volleyball competition at BNU? Would PEROS assist with the W4FT and BNU SU campaign to improve the signage that Wycombe is a Fairtrade Town to increase public footfall and awareness? NO – Being a wholesale delivering to organisations like education establishments, councils, and companies, there is little direct public contact and thus no real advantage to this regional and national company. Would PEROS assist with a future W4FT brochure/flyer of Fairtrade retailers, caterers, and other outlets in High Wycombe. YES. Peros would assist with the layout and format of the final document pre-publishing. I informed Raj of the work the W4FT had done over 2015 including closer ties and liaison with the Bucks New University and Chesham Fairtrade Committees as well as expanding the sustainable and environmental links with Friends of the Earth group and attending the International Fairtrade Towns Conference held in Bristol where the theme was sustainability. Peros is now owned by Bewley’s, and Irish coffee roasting company based in Dublin and Yorkshire. Bewleys is the leading coffee roater in Ireland with 60% of the volume. It owns the biggest coffee shop in Europe seating over 500 people. Peros will still market its Eros brand under its own label. The name Peros, which people identify with will stay, but with the suffix – a Bewley’s company. Both are committed to Fairtrade. In the US where Bewley’s operates Rebecca’s Cafés in Boston, and Java City, a coffee roasting, wholesale and cafe operation based in Sacramento, California. Bewley’s have expanded their Irish foodservice operation in the UK, acquiring Darlington’s Coffee based in London and Yorkshire based Bolling Coffee, home of the Grumpy Mule brand of sustainable coffees. Peros will act as the UK distributor and have their own selected beans from all over the world blended and roasted in Bewley’s roasting facility in Meltham NorthYorkshire. Bewleys have 9 Fairtrade brands, most being organic. Bewley’s have over 4000 outlets in Ireland with over 50% of their coffee sustainably sourced and Fairtrade certified. Peros still continue to develop direct personal contact with their growers and cooperatives. Grumpy Mule brand advertising slogan – “Morals maketh the Mule”. 1. Patisserie Valeria – all 100 cafes in the UK will have EROS Fairtrade filter coffees, including High Wycombe during 2016. 2. Peros have a new account with the manager of the Progress Bakery, on the A404 between Terriers and Hazlemere. The company haveinstalled a coffee machine in the bakery serving the public and provide the Fairtrade tea, hotchocolate and coffee. From our adventurous beginnings in the nineteenth century, Bewley’s has grown to become the largest and most recognised tea and fresh coffee brand in Ireland. Over 4,000 hotels, restaurants and cafes in Ireland proudly serve Bewley’s tea and coffee and you’ll find Bewley’s teas and coffees in supermarkets and convenience stores around the country, with the result that about one out of every two fresh coffees served in Ireland is a Bewley’s coffee. Bewley’s is at the forefront of Irish coffee culture and was the first to import Fairtrade coffee into Ireland, the first to import Cup of Excellence coffees into Ireland, the first to introduce latte art, the first to roast coffee in-store and the first Carbon Neutral coffee roastery in Ireland – no wonder we’re Ireland’s favourite coffee. But we’re not just thriving in Ireland. Bewley’s is also a global phenomenon, expanding not only in the UK and Continental Europe but also in the US where Bewley’s operates Rebecca’s Cafés in Boston, and Java City, a coffee roasting, wholesale and cafe operation based in Sacramento, California. More recently, Bewley’s have expanded their Irish foodservice operation in the UK, acquiring Darlington’s Coffee based in London and Yorkshire based Bolling Coffee, home of the Grumpy Mule brand of sustainable coffees. From our origins as a Quaker-owned company, we have always endeavoured to do business fairly at Bewley’s. We pioneered the introduction of Fairtrade certified coffee to Ireland in 1996 and today we are by far the largest supplier of Fairtrade coffees in Ireland. Fairtrade is the only certification that guarantees a minimum price to farmers as well as an additional premium for social development projects in their locality. Over 50% of our coffee roasted in our Northern Cross facility in Dublin is Fairtrade Certified. We source all our produce ethically and have direct partnerships with coffee growers in Nicaragua, Honduras, Brazil and Colombia. One such direct partnership is with the Soppexcca Co-operative Farming Alliance in Nicaragua. For the past 6 years, we have been working with this progressive community of 650 coffee growers that populate the northern highlands region of Jinotega. 40% of our coffee is produced there and just last year, we signed a new $2.1 million three year Fairtrade coffee supply contract with the Co-operative. Soppexcca particularly supports the involvement of women in society and the economy so this contract will ensure that the women working at the milling plant in Jinotega can enjoy better working conditions and a brighter future for themselves and their families. At Bewley’s we believe that all companies have a duty to act fairly in business – in a way that does not disadvantage producers, farmers and growers. The benefits are obvious – we achieve high quality for our customers, but at a fair price. This entry was posted in Wycombe News on January 25, 2016 by Mike King. This entry was posted in Wycombe News on July 14, 2013 by Tony Thornby. After last year?s successful event Wycombe Community Festival will be taking place on Saturday 13th July 2013 at 12pm-8pm on The Rye. Please register your interest if you would like to participate this year. This entry was posted in Wycombe News on June 25, 2013 by Tony Thornby. In 2013 the Fairtrade Foundation is asking everyone to Go Further for Fairtrade. 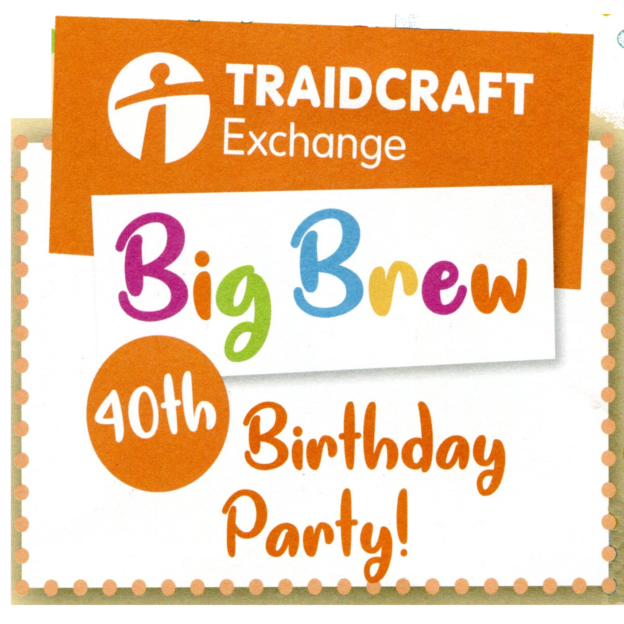 It can be as simple as trying a Fairtrade product you haven’t tasted before, and making it a permanent part of your weekly shop, to talking part in a crafty event, to asking someone in your local area to switch to Fairtrade. For the campaign for Wycombe to be a Fairtrade Town, it is doubling and trebling our effort to secure WDC agreement to explicitly says they support Wycombe becoming a Fairtrade Town and thus remove their 4 year road-block to its achievement. This entry was posted in Wycombe News on June 7, 2013 by Mike King. This entry was posted in Wycombe News on March 7, 2012 by Matt Knight. The Wycombe for Fairtrade group has recently relaunched its campaign to see High Wycombe become a Fairtrade Town. 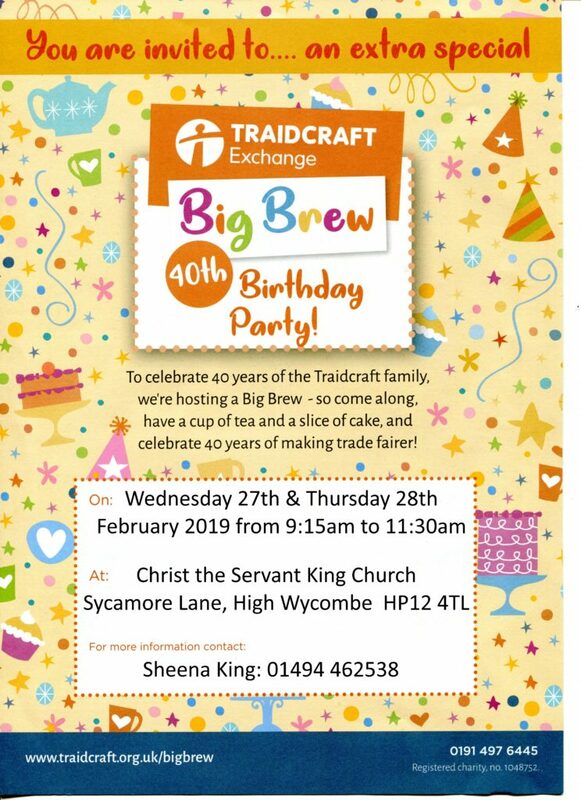 They are beginning to re-engage with local businesses, schools and places of worship and are gathering support in order to demonstrate to Wycombe District Council that Fairtrade is something that has wide support across Wycombe. Please do your part by signing the petition on the Wycombe District Council website. If you want a paper copy of the petition you can download one by clicking here. This entry was posted in Wycombe News on February 27, 2012 by Matt Knight.